A screenshot of the video sent to Addis Standard yesterday by an eye witness who was at the scene near St. Paul's Hospital Millennium Medical College shows a group of young people waiving the unofficial green, yellow and red flag and shouting "this is the flag" while a voice in the background indicates of the use of "teargas." Addis Abeba — Amidst reporters of several scuffles, confrontations and intense standoffs in various places here in the capital Addis Abeba, PM Abiy Ahmed appealed for calm, tolerance and dialogue rather than confrontations. The federal police commission commissioner General Zeynu Jemal on his part called on city dwellers and the youth from Oromia who are arriving in the capital to restrain themselves from taking matters into their own hands. The commissioner general also said the police will begin to step up its works to take measures to prevent the events from escalating. PM Abiy spoke to the national broadcaster ETV as tense events continue to unfold in various parts of the city since yesterday between youngsters who are arriving in the city from several cities and towns of the Oromia regional state and the youth dwellers of the city. The confrontation is over the hoisting of flags symbolizing the Oromo resistance movements and painting of road pavements, roads, fences and other places with similar colors of red and green with a yellow at the center by the youth from Oromia and between city dwellers who want to prevent them. Similar practice was first done by the Addis Abeba city dwellers who have indulged rather excessively with the green, yellow and red color, another unofficial flag, during the welcoming ceremony of the leadership of Patriotic Ginbot 7 this past weekend. PM Abiy Ahmed weighed on saying the political liberalization and the freedom of expression his government started to implement includes individual's rights to waive the flags of their choices. Commissioner Zeynu on his part told local radio Sheger FM that the youngsters who are coming from Oromia can waive the flags of their choice but cannot paint public spaces. He added that they were at ease when told not to paint public spaces, however, city dwellers began picking fights with the youths from Oromia rather than reporting them to the police, which escalated the confrontation. speaking to the national TV Commissioner Zeynu added that scuffles began to happen after city dwellers began taking down flags put up by the youth from oromia. He said that cars were smashed, attempts were made to burn a police station with petrol filled bottles and other properties were damaged. This should stop or the the police will take the matter seriously, he said. The youngsters from Oromia are arriving in Addis Abeba to take part in a welcoming ceremony and an open air concert on Sep. 15th. The event is organized for members of a faction of the Oromo Liberation Front (OLF) led by Dawud Ibssa. The Eritrean based OLF recently reached an agreement with the Ethiopian government to renounce its armed struggle and return to Ethiopia to continue peaceful political struggle. Scuffles first flared up yesterday around St. Paul's Hospital Millennium Medical College (see picture above). The actual reason remained a fodder for vitriolic social media debates. 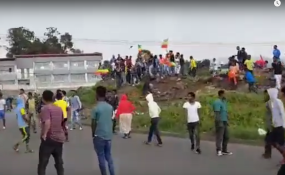 A video sent to Addis Standard yesterday by an eye witness who was at the scene yesterday shows a group of young people waiving the unofficial green, yellow and red flag and shouting "this is the flag" while a voice in the background indicates of the use of "teargas". The scuffles and standoffs have since then spread to other parts of the city including Merkato, the largest open market, and Paissa, the old town. Large contingents of riot police are currently being deployed in various places.